All shows are tailor-made to meet both your personal needs, the ages of the children and of course your budget. Please contact us with your requirements and we'll design a show to suit. For your convenience we have included guide show prices for these popular choices. The guide prices include one of our exclusive magic tricks for all the guests. 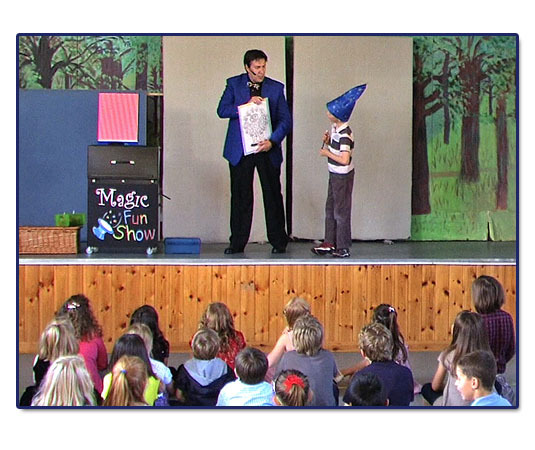 For birthday parties and special celebrations the star of the show also receives a personalized Magic DVD! This unique special gift teaches a number of simple easy to do tricks with household objects that will amaze family and friends. This DVD is custom made especially for your child and is not available anywhere else. We can also offer a complimentary balloon model if appropriate for the ages of the children but please note each model takes around a minute to make and can really eat into the show time for larger groups. For shows outside the Doncaster areas (DN postcodes) additional travel costs may be incurred. These will be agreed with Andy before confirmation of the booking - do not worry, there will be no "hidden" charges! Details of our two of our most popular shows are shown below. If you don't have time to browse this website right now, you can always download Andy's comprehensive Information Pack here to read at your leisure! 45-minutes - 1 hour of magic, comedy, puppets, music, balloons, audience participation...and FUN for all ages! Suitable for children of all ages, enjoy our popular fun and magical show with Andy and his hilarious magical pets! With loads of audience participation there is never a dull moment as things appear, disappear, transform, and float right under the children's noses. For birthday parties the birthday child becomes the centre of attention and honourary official wizard's helper for the day taking home exclusive magical gifts that will be the envy of their friends. At the end of this hilarious show, all the guests receive one of our exclusive magic tricks and the birthday 'superstar' or special guest will receive an incredible additional gift - a personalised magical DVD that teaches them how to perform some simple magic tricks. Their name is even on the DVD! And of course you can relax and enjoy the show too. Feel free to snap away with your camera or video camera to capture those special memories for your own personal use. For older children (8 - 11 years) this one-hour workshop brings magic to life as the children learn how to do a range of fun magic tricks to impress their friends with! In our exclusive Magic School show Andy begins the hands-on workshop with a short magical demonstration of mind-blowing effects. If the children love watching magic on TV or in the movies this is their chance to see it first hand and STILL IN 3D!!!! After the short show the children are taught a series of increasingly impressive magic tricks. All props and equipment are provided and by the end of the workshop they are all awarded a certificate as a fully fledged Magician! The children also get to keep the props from the amazing effects they've learnt during the workshop. This workshop is suitable for smaller parties of 12-15 children. As with all Andy's shows, the focus is on making sure everyone has an amazing time and the birthday child or special guest looks GREAT in front of their friends! © Andy Presto & The Magic Fun Show 2009..